Heat oil in a large saucepan on medium heat. Add the leek and saute for about 5 minutes or until softened. Add the carrots, zucchini and potatoes and saute for about 3 more minutes or until mixed well and beginning to soften. Add the tomato paste and chicken stock and simmer, partially covered for about 30 minutes or until the vegetables are tender. Add the garbanzo beans and cook another 3 minutes or until heated through. Add the salt and pepper. Process the soup with a hand blender in the soup pot until pureed. Add the parsley and taste for seasoning. 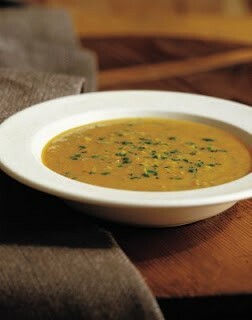 To serve: Ladle the soup into shallow soup bowls and garnish with the parsley and lemon rind. To dress this up consider adding a dollop of Basil pesto or Sun-dried tomato pesto to the herb garnish. Cheese croutons would also be a good accompaniment.